"2016 S.S. Meteor Project Photos"
The S.S. Meteor Preservation and Stabilization Project is coming up fast. The date is April 29 & 30, 2017. Barkers Island Hotel is offering a $50.00 per night room. The S.S. Meteor Preservation Project 2017 was another very successful project. Why do I call it “another successful project”? It’s because I keep hearing how many tasks are completed every year and that it is looking so good on the outside, it almost seems as if it just pulled into port after a major paint job. It actually looks better than it was when it first became a Museum Ship. Because of the last thirteen years of volunteer efforts and that it looks so good, the process of nominating the S.S. Meteor as a National Landmark has been started. Those that have participated in the preservation and stabilization of the S.S. Meteor should be proud that they made a difference in preserving maritime history! Good luck to Sara Blanck, the staff at the Superior Public Museums, and others that have stepped forward to help in the process for National Landmark Status. The 2017 preservation project turned out to be another project where the volunteers were able to complete thirty-seven tasks this year. Even though it is equally important to list all the tasks completed and who performed the tasks I would be writing a very long article. So, I will touch only on the larger projects this year. Every year we have to complete the same annual tasks. The volunteers do a great job on it each year. Some are the cleaning tasks around the ship museum. One annual cleaning task that is a fairly nasty is cleaning the bird poop off the upper deck on the starboard aft side of the ship where the birds roost. The S.S. Meteor gets a bath each spring and it is typically a thankless job but we find one or more volunteers that step up to the challenge none the less. It’s cold outside and you are mostly wet the entire day. Special thanks to the folks that performed that nasty task, especially if it’s cold outside. Other important tasks completed this year was the welding. A large rusted area has been noticed on the port side under the forward cabin floor. Craig David set forth to cut out all the old rusted metal and weld in new. This year we had extra help with welding by a volunteer from the local Technical College. The School’s welding Instructor and one of his students joined us and they took on the task of welding the rusted roof on the front turret. It’s very nice to see another large project completed this year. One of the most important projects this year was the much-needed water control in several areas of the ship. The lower parts of the ship called the bilge are filling up with water. Currently, they only had one sump pump pumping once in a while, which was not enough, especially with the large amounts of rain they have received for the past few years. So, the task of installing three more sump pumps with floats was implemented to help keep this issue at bay. Thanks to Tim Pranke and his crew they were able to complete it by the end of the work weekend. Other large projects such as building the platform out of wood in the upper engine room to be able to prepare and paint the entire upper engine room safely. Thank you to the Musial Brothers for completing that task! Every year we have a long list of painting projects/tasks that need to be completed each year. One of the largest this year was the wall on the starboard side of the ship which leads to the engine room was prepared and painted. The Captain’s balcony floor and a couple of the crew’s quarters floors. In one of the crew’s quarters (2nd Mate), we had to mix and lay concrete on top of the subfloor which is metal. First, we had to treat the metal by cleaning the rust off of it, add primer and then paint it to prevent it from rusting in the future. After the concrete sets, it will be painted. It will probably be painted in the summer when it’s warmer. The other large painting task was on the rear aft deck. The water tanks were painted the correct historical color. The red colored (37 of them) were repainted. The poles holding the lifeboat nets were also painted their final coat of white paint. Another task that was completed was the old benches that were outside of the main door on the museum ship. The benches had rotten lattes/ boards on them and had a concern that they would break at some time. Dale Koziol took the task on and replaced all the wood on the metal frame of the benches. They were mounted down to the aft upper deck for people on the tour to rest if needed. Thank you, Dale Koziol, for completed that task. While we were working on the S.S. Meteor during the work weekend we received great news. The display cases that we removed the artifacts from and, were rebuilt over the last two years, were finally going to get new content for the displays. The artifacts were still the same but the display cases were going to receive a new look and new language describing the artifacts. It was quite a surprise and was very welcome. All that hard work the past two years on the displays are paying off. The great thing is that there was a grand opening party event scheduled two weeks after the work weekend, and we were all invited. 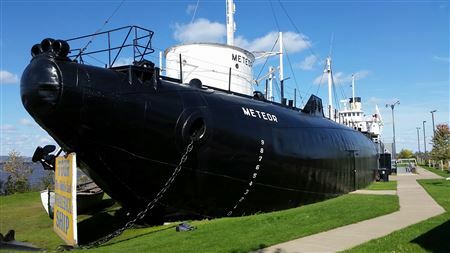 As you can see and hear, the S.S. Meteor Whaleback Museum is getting better and better by the year. It's making its mark in the maritime history preservation archives. Lubricated the moving parts of the main steam engine. Serviced the compressor that supplies air for the whistle. There were many other small tasks that were completed during the work weekend. The list goes on and on. If you want to see the entire list of tasks, please go the GLSPS website at, www.glsps.org and click on the “Project Archive” button and select the S.S. Meteor Project. Regardless of how many years we’ve been performing stabilization and preservation on the S.S. Meteor, we still have much to do. If you or anyone you know is interested in joining a large number of volunteers to help preserve maritime history and have a chance to work on a ship for a weekend, please let us know. The project will go on as long as I am able to or until we are ordered to stop. This year we had a loss of a good friend and colleague of the S.S. Meteor, Don Smith. He was the Maintenance Director of the Superior Public Museums and was quite a bit of help in preparing, before during and after the work weekend. His involvement and enthusiastic demeanor in the preservation project from the beginning when it started in 2001, was amazing. So, we decided to design and build a commemorative bench to celebrate his life. Thank you to Dale Koziol for performing that meaningful task! We placed a plaque on the bench and placed it outside of the museum’s main doors. If you get the chance, please have a seat on it and thank Don Smith for all his work and involvement with the preservation of the S.S. Meteor Whale Back Ship Museum. We all appreciate Don Smith for his integrity and skills and we will miss him wandering around the ship on the work weekend letting us know what needs to be done and how. Thank you to all the volunteers that helped in this year’s S.S. Meteor Preservation Project work weekend, which was April 29 and 30, 2017. We appreciate you taking your personal time and resources to help preserve a very valuable piece of maritime history. We hope you continue to join us for a future project. In the last 13 years, the S.S. Meteor Preservation Project has been scheduled for the last weekend of April. This will remain the same. The next Project weekend is scheduled for April 28 and 29, 2018. Please mark your calendars for this weekend. We hope to see many of the familiar faces and some new faces as well.